The Scriptures are clear that these three Persons together are one and only one God (Deut. 6:4). John 10:30 and33 explain that the Father and the Son are one. First Corinthians 3:16 shows that the Father and the Spirit are one. Romans 8:9 makes clear that the Son and the Spirit are one. And John 14:16, 18, and 23 demonstrate that the Father, Son, and Spirit are one. 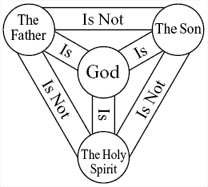 In the Old Testament, the Bible implies the idea of the Trinity in several ways. The title Elohim (”God”), for instance, is a plural noun which can suggest multiplicity (cf. Gen. 1:26). This corresponds to the fact that the plural pronoun (”us”) is sometimes used of God (Gen. 1:26; Isa. 6:8). More directly, there are places in which God’s name is applied to more than one Person in the same text (Ps. 110:1; cf. Gen. 19:24). And there are also passages where all three divine Persons are seen at work (Is. 48:16; 61:1). The New Testament builds significantly on these truths, revealing them more explicitly. The baptismal formula of Matthew 28:19 designates all three Persons of the Trinity: “Go therefore and make disciples of all the nations, baptizing them in the name of the Father and the Son and the Holy Spirit.” In his apostolic benediction to the Corinthians, Paul underscored this same reality. He wrote, “The grace of the Lord Jesus Christ, and the love of God [the Father], and the fellowship of the Holy Spirit, be with you all” (2 Cor. 13:14). Other New Testament passages also spell out the glorious truth of the Triune God (Romans 15:16, 30; 2 Cor. 1:21–22; Eph. 2:18). In describing the Trinity, the New Testament clearly distinguishes three Persons who are all simultaneously active. They are not merely modes or manifestations of the same person (as Oneness theology incorrectly asserts) who sometimes acts as Father, sometimes as Son, and sometimes as Spirit. At Christ’s baptism, all three Persons were simultaneously active (Matt. 3:16–17), with the Son being baptized, the Spirit descending, and the Father speaking from Heaven. Jesus Himself prayed to the Father (cf. Matt. 6:9), taught that His will was distinct from His Father’s (Matt. 26:39), promised that He would ask the Father to send the Spirit (John 14:16), and asked the Father to glorify Him (John 17:5). These actions would not make sense unless the Father and the Son were two distinct Persons. Elsewhere in the New Testament, the Holy Spirit intercedes before the Father on behalf of believers (Rom. 8:26), as does the Son, who is our Advocate (1 John 2:1). Again, the distinctness of each Person is in view.